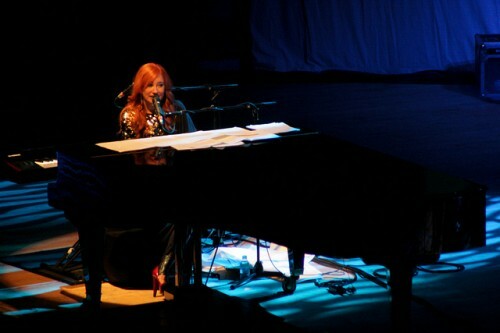 Ruby-tressed siren Tori Amos brought a breathtakingly beautiful evening of music to DC’s D.A.R. Constitution Hall on Monday night. She is in the midst of a world tour in support of her latest album, Night of Hunters, released in September on Deutsche Grammophon Records. The album is described by Amos as “a 21st century song cycle inspired by classical music themes spanning over 400 years.” For the tour she brought along the string quartet who played on the album, Apollon Musaget Quartett, from Poland.